Various cool bestbuyimmediately.com official website. Encounter bestbuyimmediately.com is the most famous on earth for people worldwide. Peer reviewed publications from academic institutions essentially offer a platform for sharing the views and ideas of research / theory / concepts. It is based on trust among various stakeholders viz. editors, peer reviewers, authors, readers and publishers. Their contribution result in mutually beneficial and sustainable publication. 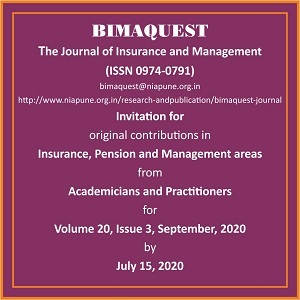 BimaQuest, The Journal of Insurance, Pension and Management, follows double blind–peer review and selection - process. Editor(s) mediate exchange of views of authors and reviewers prior to publication, without disclosing identities. Based on the practices and learnings of our publication, BimaQuest, since 2001, ethics guidelines are prepared and presented with an aim to promote good practices among all stakeholders. Original manuscripts not so far published or being submitted for publication elsewhere be submitted for publication consideration. A declaration to this effect is submitted to the Editor by all the author(s) before publication. Material presented in the seminars / conferences etc., need to be explicitly stated in the manuscript while submitting for publication. Corresponding author(s) and preferred citation style should be clearly identified and their contact details (phone, email and address) are to be provided. Authorship credit should be based on substantial contribution from conception of ideas to final version of the publication. Information of all contributors to the manuscript should be provided. The contribution of those who are not eligible for authorship credit and persons / organizations funding the study / research should be listed in the acknowledgement with their approval. Contributions, such as case / research studies company specific data / practices, are to be accompanied with Release Letters from the organisations and / or funding agencies that funded the contributions. Type of manuscript (Articles /Research Paper / Case studies etc.) to be submitted for publication considerations and guidelines for such submissions, including requirements for submissions of funded manuscripts. Process followed for review of the submissions received for publications, including the submissions from authors having possible conflict of interest in the publication. Research misconduct, dual / multiple publication, plagiarism etc., and queries / dispute, if any, regarding authorship before publication, the manner of initiating corrective actions. Copyright related statements, procedure followed for relinquishing copyright by author(s) and information regarding the possible inclusion of the contents in open access electronic sources / indexing services. Publication of errors or corrections in the material published, if noticed / brought to the notice, under a separate paper / column. Research misconduct, dual / multiple publication, plagiarism etc., and queries / dispute, if any, regarding authorship after publication, the manner of initiating corrective actions. Process to be followed for obtaining the permissions for reprint / translations of the manuscripts originally published. Timely submission of the material after review. Material accepted for review to be treated in confidence until it is published. Intimation of information related to dual / multiple publication, originality of material etc., during the review process or after the publication to the publisher. Declaration of the interests and affiliations, wherever required, in the publication process by all the stakeholders of the publication. When editor(s)/members of Editorial Board is/are the contributor(s) to the journal, the editorial decisions involving their manuscript will be handled by the Advisory Committee. Submissions from employees of the publisher is treated like any other submission received for publication consideration and are subjected to the similar review and selection process followed for processing submissions received from non-employee contributors. In case of conflict of interests with the material being asked for a review, the peer reviewers are to decline the invitation stating the reasons / disclose the facts.